I’m not gluten free by any means but I have had gluten free pizza. At the whole foods in Glendale they make vegan pizzas at the pizza bar but only make them with a rice crust. I would say they’re pretty decent and the price isn’t insane for hot food from whole foods (which is already pretty high) but given the choice I would definitely go for the regular crust. The rice crust is thinner and crunchy but has that sort of gelatinous texture you get when making baked goods with with rice. YIKES! I know Amy’s makes a gluten free pizza. It’s decent and the crust falls apart really easily. But it’s not 450 calories just for the crust. That’s insane! 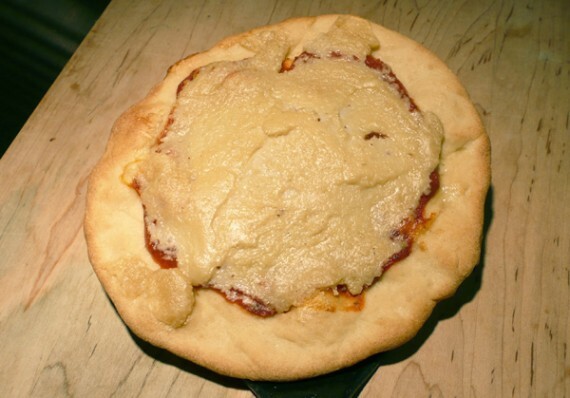 I once saw a pizza crust made out of cauliflower… GF but not vegan, it had eggs. Might be with trying to veganize. With = worth. I’m so dedicated I read this site on my iPhone. Well, Mr. Meaner, my mom has Celiac and, thus, is gluten intolerant. I took her to Sensitive Baker (the Culver City storefront) for her holiday treat this past year and she was also fairly unimpressed. The nice woman who runs the place gave me a GF vegan snickerdoodle that left a lot to be desired (this is all on my backburner for a blog post at some point). My mom bought a ton of stuff, including cheesecake, brownies, burger buns, and more. We took one of the burger buns to Mani’s when we later had lunch there. I think Sensitive Baker provides a great service that doesn’t quite live up to expectations. I hope they’ll keep tweaking their recipes until they completely succeed. Anyway, I realize you had questions, so here goes! I’ve made GF vegan foccaccia for my mom (similar to pizza dough, obviously, but not the same) and it didn’t quite work. I followed the recipe exactly, it’s just that GF flours can be inconsistent. I’ve promised to try again and I have a plan in mind for that. My mom has started baking her own bread, although I think she’s been baking it from a mix. She’s even made her own GF pasta (I like quinoa pasta for GF purposes). I’ve sampled a lot of GF foods since she was diagnosed and the truth is that I’ve never had one that tasted close to its counterpart. Sometimes they’re a little stale tasting and sometimes they over-compensate with extra fat and/or sugar, which isn’t cool in my book. As far as I can tell, though, yes, some gluten intolerant people really are that desperate for pizza that they’ll suffer through something not so tasty to have it. I personally like a brown rice crust that I find frozen at FYH and WF, but it honestly tastes like you’re eating pizza on chewy brown rice. So, one needs to go into such things expecting that as opposed to expecting pizza crust. Other rice doughs I’ve had are a bit off in texture, but serve the purpose. My apologies for the novel-length response; I hope it helps in some way! OMG I was going to tell you about this place because I bought J-Dubs her birthday cupcake here. Then I looked at the menu, saw the Vegan Pizza and Mac and Cheese. I bought the same little pizza, took it hope and was quite dismayed. I’ve got some GF chocolate cupcakes in my oven as we speak. We’ll see if there’s hope for the world in about 5 minutes. 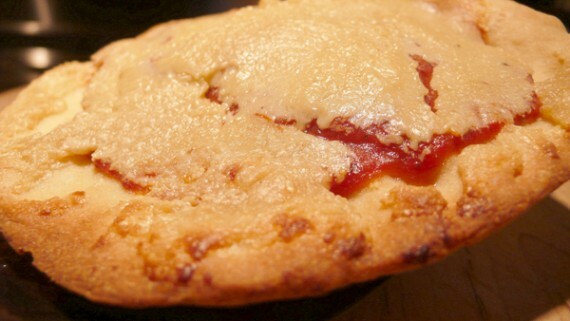 http://eatnvegn.blogspot.com/ is gluten free. She cooks up some bomb food. Interesting on the one hand because her post reveals that she has the attitude of being very dismissive about gluten sensitivities and people with Celiac disease, e.g., blowing these people off as not really being ill but just latching on to the latest fad. While I agree that many of the people claiming to be allergic to wheat and gluten simply heard about it on TV, from friends, or on a box at Whole Foods and are not actually allergic. I know people like this who claim to have every “alternative” disease, sensitivity and imbalances they hear about in the news, but I’m also well aware that many people actually do suffer from these issues and therefore dismissing them as being fakers is pretty lame, and must be very frustrating to the people with these conditions. Point being, people without wheat or gluten conditions are buying up this expensive stuff, much of which tastes like crap, because they think it’s healthier or more politically correct (like buying local, organic, GMO-free, etc…), when realistically there’s no reason to seek out gluten-free foods unless your body genuinely can’t tolerate gluten. 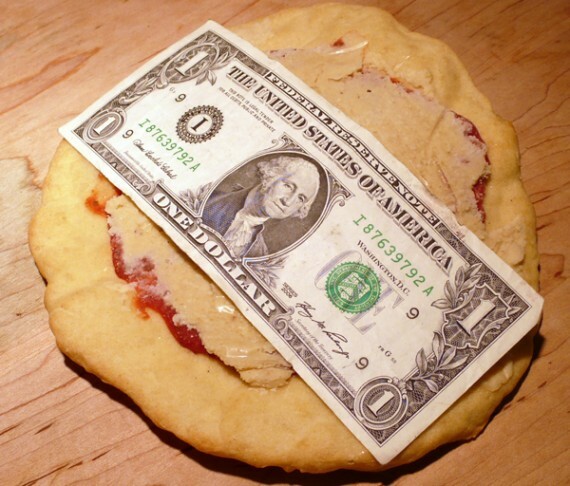 Just one more reasons to never have to suffer thru nasty overpriced pizza again! I have never taken up the challenge but it is possible to have a GF Vegan pizza that tastes good! The easiest way to accomplish that is with a GF Vegan corn crust, which I’ve found at the Santa Monica Co-Op, this has a great flavor and texture for pizzas, as many mom and pop/italian based pizza shops use cornmeal in conjunction with the wheat dough. All in all most of the flavor comes from the sauce and toppings. For me I always use a pasta sauce and add a bit of seasoning (usually Italian seasoning) and tomato paste to thicken it up. Use follow your heart soy cheese which is GF and add GF toppings. One hint for bringing out more flavor in general is to sprinkle a bit of cumin on the top before baking. You could also choose to bake your own rice crust which would turn out better then those chewy frozen ones, just use a vegan recipe and replace the flour with white rice(I’ve found brown rice flour to be too grainy in other baked goods) and add a bit of xanthan gum just for some extra binding as most people say you don’t have to use it with rice flour, but I still use it anyways. In regards to the GF fad there is a “fad” as people test out their diet to see if any improvements happen with the removal of gluten. There are people who minority suffer with an intolerance then there are people who are straight up allergic. For a friend of mine it was causing digestive issues where she would not poop for five days or more for a healthy digestive system you should be pooping every day! So gluten intolerance can cause a wide range of various issues dealing being over weight or even under weight, and other digestive problems. However they shouldn’t be suffering with crappy food! Food allergies are commonly undiagnosed & misdiagnosed. Anyone thinking they might have a serious food allergy should see an Environmental Allergist (MD) from http://www.aaemonline.org The American Academy of Environmental Medicine and complete extensive testing. Most of the time the allergy can be treated in as little as 5 weeks so you can enjoy the foods in moderation again. Its expensive, but compared to those pizzas if you’re health insurance covers it its worth every penny. 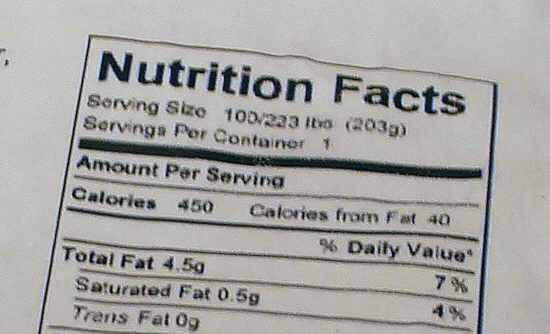 so I’m guessing you haven’t looked at the nutrition information on a pizza box recently. As for gluten free baking, I’ve had some really good gluten free cake before at a friend’s birthday party. I don’t think I’ve had gluten free bread, but I’m not allergic to gluten or anything that I know of. Gluten protein makes bread chewy so gluten free recipes have to have eggs, guar gum, and/or other thickeners. I am gluten free (not by choice) although I do understand some of the fad because some people who don’t have to eat gluten free actually feel better/lighter by eating the alternatives to gluten. I have been gluten free for over 10 years and I do believe our radar for taste does shift. I used to just get excited for anything gluten free, but now that it has become a more popular thing, the competition is making things more palatable. Its taken this time to learn what works. I have eaten some really good gf pizza and plenty bad. Whole Foods has a selection of frozen gf crusts that all have different qualities and tend to make my own pizza with those. 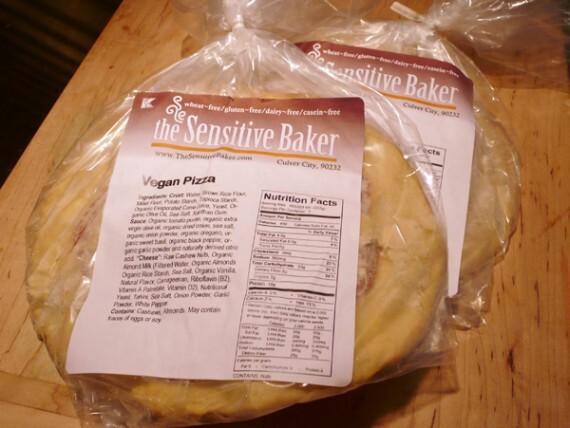 Sensitive Baker has changed their owner and are constantly updating their recipes and products. I bought their pizza crusts last time I was there and it was fine. It wasn’t what you have shown here. Since I have whole foods, I probably won’t buy those again, but I do love their treats! !